Making Taco Tuesday a tradition in your house is crazy simple and a great idea. Here are some Taco Tuesday Ideas for your Fun DIY Taco Tuesday Night. We’re all familiar with the phrase “Taco Tuesday”, but is it something that you actually do in your house? So many people tend to refer to Tuesday as the day for Taco’s, but very few people that I know actually make and eat tacos on Tuesday. In our house, Taco Tuesday is a thing! Not only does it have a nice ring to it, but it’s something that we look forward to weekly as well. I am excited to introduce you to the sponsor of this post, Fresh Cravings. While the views expressed here were genuinely mine, consideration was paid to me by Fresh Cravings. Waking up and knowing immediately that it’s Taco Tuesday is an exciting feeling because tacos and all their toppings are seriously just that good! Honestly, making Taco Tuesday a family fun tradition is super simple and so much fun! Can you imagine waking up and realizing that the day will end with delicious tacos, plus bonding and conversation with your family? While tacos may bring your family closer, the true tradition that you’ll remember forever is that your family connected over a fun phrase and delicious food. Making Taco Tuesday a tradition in your house is crazy simple and a great idea. Don’t let anymore Tuesday’s pass you by without enjoying some delicious DIY taco’s as well. Here are some Taco Tuesday Ideas for your Fun DIY Taco Tuesday Night! Let’s face it…food brings people together. The larger the food spread, the more people will want to attend and hang out together. When it comes to family gatherings and creating traditions, it’s a safe bet setting a certain night as “family night” with a fun and festive food theme. If your family loves tacos it’s only logical to have a tradition to spend every Taco Tuesday together chowing down on a delicious taco spread! First and foremost, get your toppings in order! Everyone likes something a little bit different on their tacos, so plan on having many taco toppings to choose from. Once you get your toppings ready, all that’s left to do is load up your tacos and enjoy! Last but not least, don’t forget the Salsa. Our salsa of choice? Fresh Cravings Salsa. If you’ve never had this salsa before, you are in for a true treat. It’s the perfect blend of heat and sweet, all in one bottle. 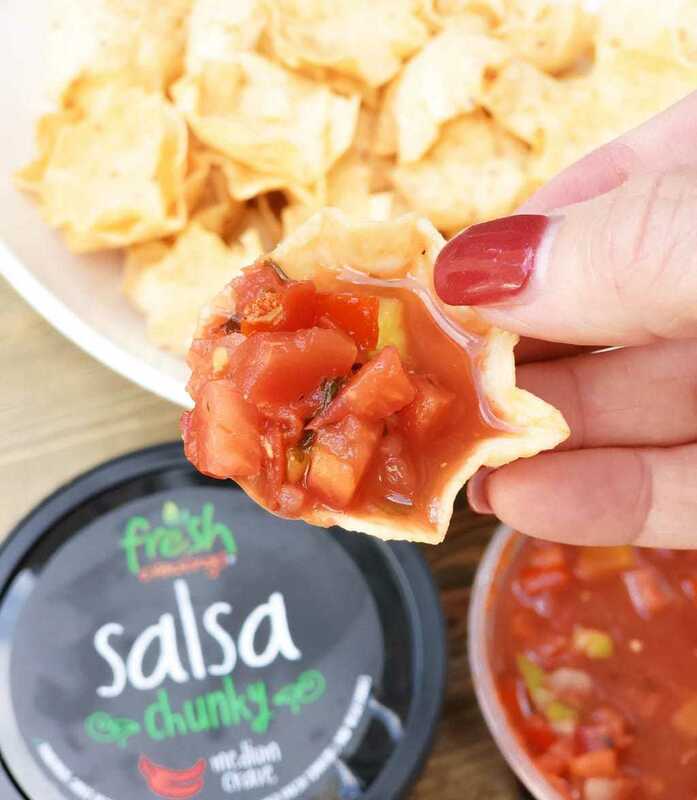 Fresh Cravings believe in making a salsa that’s fresh and never cooked. It’s made with sun-ripened vine tomatoes and the perfect blend of pepper and spices. Everyone in our family agrees that this salsa is the best. 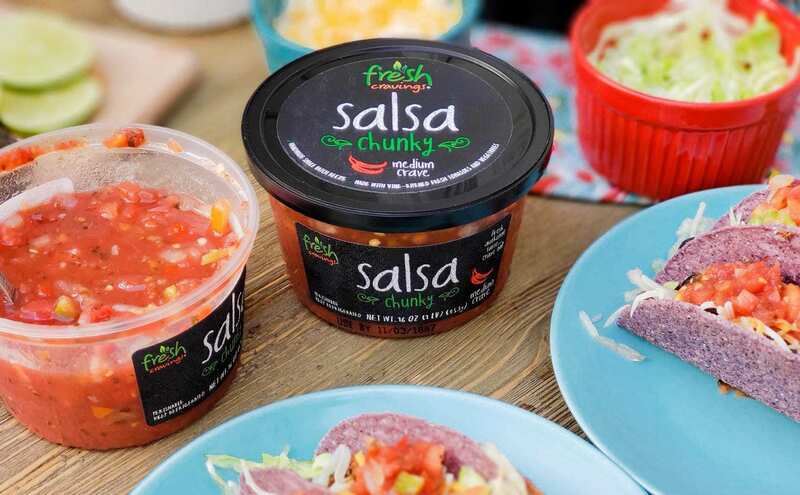 You can find Fresh Cravings Salsa in the chilled produce section, near the bagged salads at Wal-Mart. The tubs are perfect to share and great for party starters too! 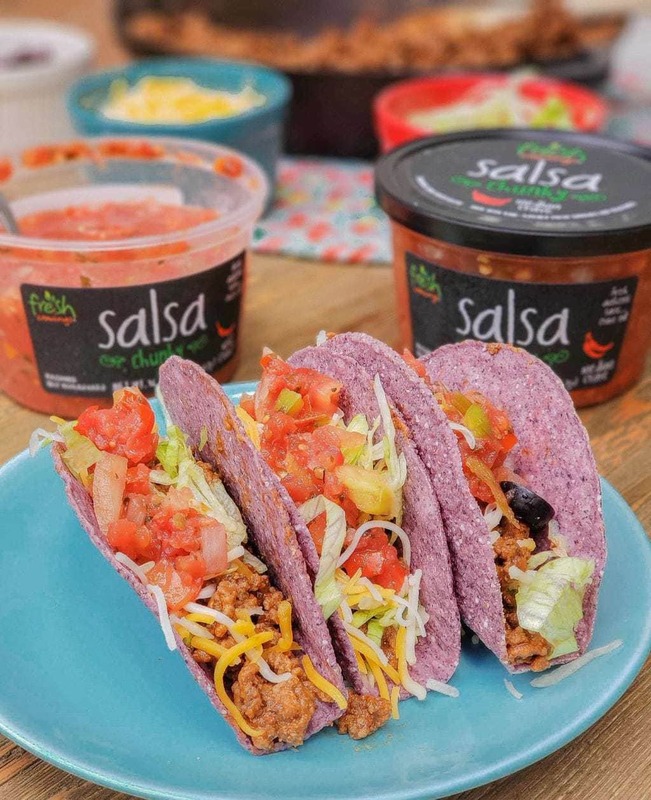 While Fresh Cravings Salsa goes perfectly on tacos, it’s also great on other food items as well such as eggs and nachos! 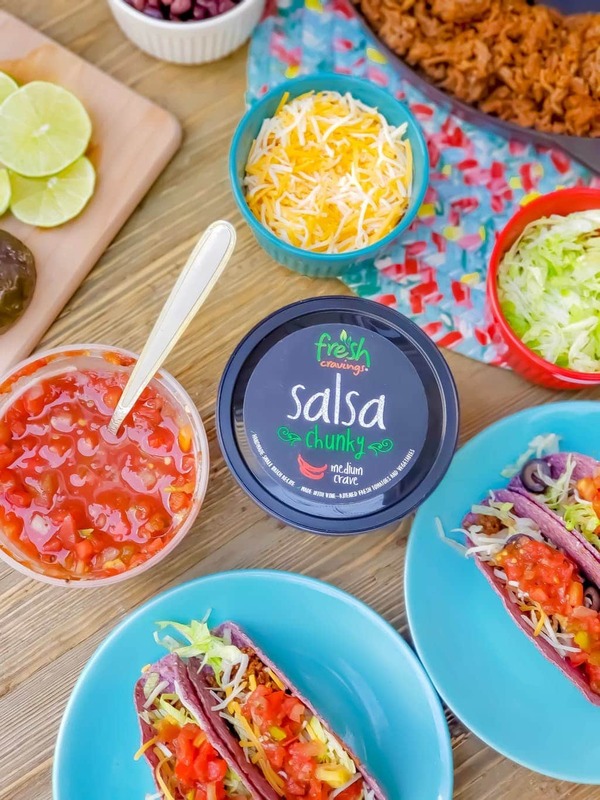 In fact, Fresh Cravings is now offering a convenient grab and go Salsa and Tortilla Snack Pack option for those who need a snack when out and about. It’s also perfect for school lunches or an after school snack for your kiddos! There is currently an Ibotta deal on Fresh Cravings Salsa 16 oz. tubs available nationwide at Walmart. You can earn $1.00 cash back. Give your family traditions a kickstart and add Taco Tuesday to your calendar. Your family will love the taste and all of you will have fun rediscovering each other as well. Who knew that tacos and Fresh Cravings salsa had the ability to bring families closer? Taco Tuesdays are fun, festive and the perfect way to start a new weekly tradition for you and your family. 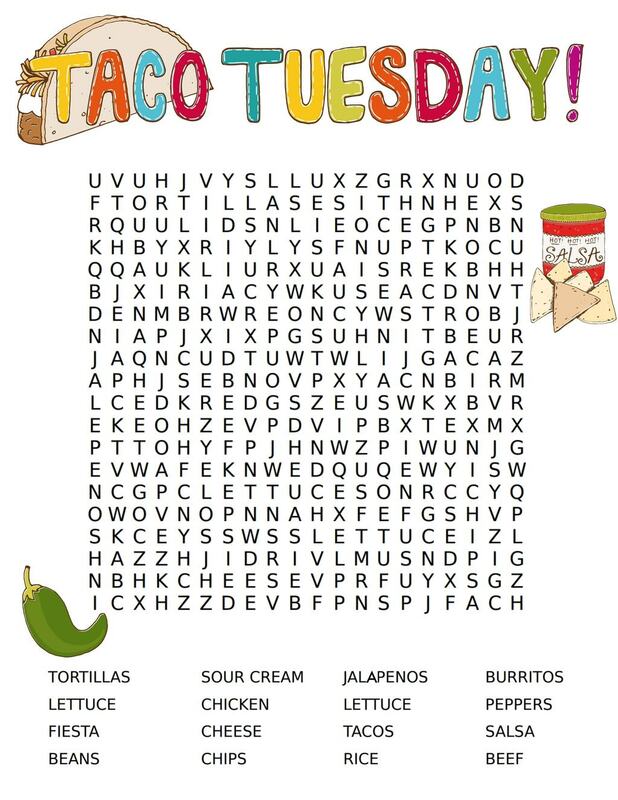 To make it even more fun on Taco Tuesday, print this Taco Tuesday Crossword puzzle for the kids (and mom too!) Print by clicking image.